Yannick Alléno, former chef of Le Meurice, will open his second Terroir Parisien bistro in Paris on November. This outpost will be located inside the Palais Brongniart, better known as the former stock exchange. It will feature 140 seats as well as a "rillettes bar" displaying rillettes prepared with tuna, trout, salmon or chicken, and a charcuterie space, offering pâtés, ham, and dry and blood sausages. Terroir Parisien, Palais Brongniart 28, place de la Bourse, 75002 Paris, no phone. Eric Frechon, chef of the Hôtel Le Bristol, has launched a new restaurant, Lazare. Located inside the Saint-Lazare train station near the Palais Garnier, Lazare is open all day and proposes French specialties. Lazare, Gare Saint-Lazare, 75008 Paris, no phone. 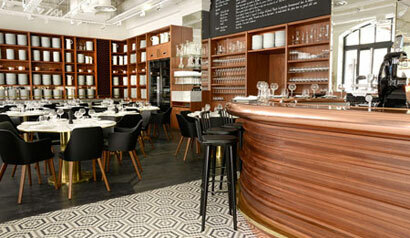 Restaurateur Nicole Rubi has opened the Parisian version of her Niçoise establishment La Petite Maison de Nicole. Located in the Hôtel Fouquet’s Barrière Paris, the restaurant transports the tastes and aromas of the Côte d'Azur to the Champs-Élysées each night. La Petite Maison de Nicole, Hôtel Fouquet's Barrière Paris 46, av. George V, 75008 Paris, 01 40 69 60 88. Le Vernet chef Laurent Poitevin will deliver two menus devoted to caviar from September 17-27. Lunch at €65 comprises two courses served with caviar, a slice of bread coated with Salers beef and a crunchy coley on watercress cream, plus rum baba for dessert. The dinner menu at €120 features the luxury fish eggs accompanying a charlotte potato, a soft-boiled egg with artichoke velouté and smoked eel, squid stuffed with cod and lemon risotto, and, as a finale, a strawberries carpaccio with fromage blanc. Le Vernet, Hôtel Vernet 25, rue Vernet, 75008 Paris, 01 44 31 98 98. Alain Ducasse is supervising the kitchens of Le Meurice hotel. As the Hotel Plaza Athénée, home of two restaurants over which he presides, closes its doors for refurbishment, he considers his new challenge as a means to perpetuate his French contemporary cuisine over there. The 70-persons brigade will be maintained, dispatched between the gastronomic Le Meurice, the brasserie Le Dali and Bar 228. Le Meurice, Hôtel Le Meurice, 228, rue de Rivoli, Paris 75001, 01 44 58 10 55. Jacques Le Divellec, owner of Le Divellec, a hallmark seafood restaurant in Paris, has sold his establishment to the Costes group who already rule many restaurants in Paris, such as L'Avenue and Thoumieux. Le Divellec is expected to close at the end of October. Le Divellec, 107, rue de l’Université, Paris 75007, 01 45 51 91 96.